These were the words of Antoine van Agtmael, who also coined the phrase “emerging markets” and built a successful investment firm around the concept. 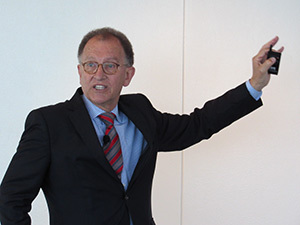 Van Agtmael was speaking at a recent event we hosted with the Central Indiana Corporate Partnership to discuss his new book The Smartest Places on Earth: Why Rustbelts Are the Emerging Hotspots of Global Innovation. There was a vigorous discussion of how Indianapolis compared to other emerging rustbelt metropolises in combining university research with smart manufacturing technologies and open, collaborative partnerships among firms and across sectors, facilitated by entrepreneurial and community-minded “connectors.” Many of these connectors could seek their fortune in any of the world’s recognized hot spots, but instead they remain committed to enhancing the talent base of their community. It is because they seem to be motivated and inspired by philanthropy that we wanted to co-host this book talk in Indianapolis. The discussion also focused on an important requirement for the new innovation hubs described in van Agtmael’s book: they all rely on the U.S.’s world-leading commitment to basic research, the kind that is purely exploratory and whose ultimate applications are not yet known. No other country comes close to the government-funded commitment, supported by philanthropy and industry, to the kind of pure research that led to the Laser, the Internet and the description of DNA – discoveries that today continue to enable a profusion of inventions. Interestingly enough, as a community, philanthropy has not paid much attention to basic research in our own field. We seem permanently impatient, grasping for the next effective application whose impact can be measured before the next board meeting. There is a flurry of novelty, from the tools with which we can develop relationships with each other, to clever ways of spanning the commercial, public and voluntary sectors. But often I wonder how much of this energy would be better directed if there were clearer understanding of what happened before. Would it not be beneficial to the impatient entrepreneurs in philanthropy, as in the emerging tech hubs of our re-emerging cities, if there were a body of cumulative basic research, motivated by the puzzle of human philanthropy, that could undergird the brilliance of our social innovators? The Lilly Family School of Philanthropy is one outpost of basic research, vitally connected to the emerging generation by our growing body of exceptional students and mid-career professionals. 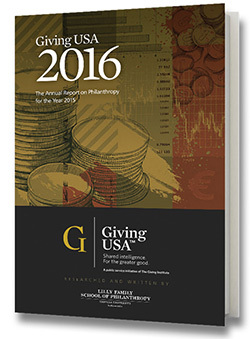 We do produce the annual “GDP of giving” in the United States, Giving USA, with Giving USA Foundation, and we steward a powerful source of data on U.S. households in the Philanthropy Panel Study, complemented by a growing body of historical, humanistic, social scientific, experimental and even neurological studies that shine ever more light on the human impulse to give, to help, to craft new connections. But, you may ask, how will this help me structure the next impact investment in my town to bring greater resources to the communities with pressing needs? But this question is as misdirected as the one that asks basic scientific research to demonstrate its relevance to current technology. Imagine asking questions about how to deliver information through the mail or the telegram before there was the Internet and the omnipresent, connected computer in everyone’s hands. There are unimagined means to newly understood ends that await us as a result of basic research into the fundamental questions of why people give. Remember that science fiction imagined many of our contemporary social changes long before the actual technologies were available. In this context, think of the public policy conversations we are having as more and more people do not participate in the workforce. Some experts believe this will become a permanent condition as robots take on more “work” functions. As jobs diminish as a source of our sense of worth and dignity, how we measure our contributions to our communities and our time on earth may well become more about how we choose to exercise our philanthropic faculties. Are we ready for this kind of eventuality? Our school is working to conduct and support basic research in philanthropy and we seek new friends and allies in this quest on a daily basis. We prefer our philanthropy untoasted. American individuals, estates, foundations and corporations gave an estimated $373.25 billion in 2015, reaching a record level for the second year in a row, the just-released Giving USA 2016 estimates. That’s an average of more than $1 billion a day in charitable giving. “If you look at total giving by two-year time spans, the combined growth for 2014 and 2015 hit double digits, reaching 10.1 percent when calculated using inflation-adjusted dollars,” said Giving USA Foundation Chair W. Keith Curtis, president of nonprofit consulting firm The Curtis Group, Virginia Beach, Virginia. Total giving grew 4.1 percent in current dollars (4.0 percent when adjusted for inflation) in 2015 over 2014, Giving USA 2016 estimates. “The last two years represent the highest and second-highest totals for giving—and the third and fourth largest percentage increases in giving—in the past 10 years, adjusted for inflation,” said Amir Pasic, Ph.D., the Eugene R. Tempel Dean of the Lilly Family School of Philanthropy. The sustained growth in total giving for 2014 and 2015 may be due in part to the country’s overall economic environment continuing its path to recovery and household finances seeming to stabilize. Contributions from all four sources increased, with 71 percent of all dollars given coming from living individuals. The largest year-over-year percentage increase in contributions from sources came via grants made by the country’s independent, community and operating foundations, according to data provided by the Foundation Center. Foundation giving grew 6.5 percent in current dollars, and 6.3 percent when adjusted for inflation in 2015. Giving to eight of the nine major types of nonprofit organizations included in Giving USA rose, with only giving to foundations declining. The report provides a detailed examination of giving to each source and type of recipient nonprofit and the factors influencing it. Giving USA, the longest-running and most comprehensive report of its kind in America, is published by Giving USA Foundation, a public-service initiative of The Giving Institute, and researched and written by the Indiana University Lilly Family School of Philanthropy. Personal experiences and the realization that giving to women is a powerful way to effect large-scale change in society are two key reasons women give to causes that benefit women and girls, new research by the Women’s Philanthropy Institute shows. The report sheds light on the growing visibility of women’s and girls’ causes. The first to explore donor’s methods and motivations for supporting such issues, it includes important findings for funders, advocates, fundraisers, and wealth managers and identifies factors that might prompt people who don’t currently support these causes to do so. “As more and more people make the connection between giving to women and societal change, we can see that giving to women and girls is not just a temporary trend but is here to stay,” said Debra Mesch, Ph.D., director of the WPI and the Eileen Lamb O’Gara Chair in Women’s Philanthropy. Many donors reported supporting these causes because of personal experiences, including discrimination, the birth or raising of a child, or experiencing a health issue. Among people who donate to charity, 50 percent of women and 40 percent of men said they give to women’s and girls’ causes. Many women donors’ support for these causes is motivated by their desire for gender equality in society. Despite the momentum in giving to women’s and girls’ causes, there is limited academic research about it. This latest research, funded by the Bill & Melinda Gates Foundation, adds empirical evidence to the conversation on gender differences in philanthropy. A series of three reports--Giving to Women and Girls, Do Women Give More? and Where Do Men and Women Give?, along with a comprehensive literature review, illuminate the role gender plays in philanthropy and how and why women give differently than men. Younger family members’ philanthropy is affected by their elders, and understanding the intra-family generational dynamics that lead to charitable giving decisions can help families, charitable organizations, and advisors better plan for the future, a new study finds. Parents who volunteer with nonprofits are more likely to have children who volunteer for, and give to, nonprofits. While the philanthropic priorities of parents and their children are more closely aligned than those of grandparents and grandchildren, grandparents can still influence their grandchildren’s giving. Parents with certain socio-demographic characteristics have a stronger influence on their children’s overall giving and on their religious giving. Colombians and others now have greater access and insight into the nation’s flourishing nonprofit sector as a result of a groundbreaking website, database and research study developed by a Lilly Family School of Philanthropy student. “To strategically address human needs and help strengthen civil society in Colombia, it first is important to know what the philanthropic landscape looks like,” said Van Evans, who conducted the research and created the resource. 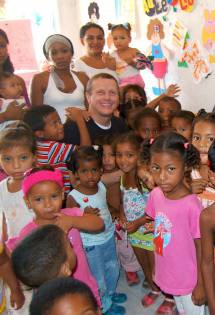 Evans recently completed his Ph.D. at the school and is a long-time professional in the international nonprofit sector. The new resource will increase the visibility of the country’s nonprofits, facilitate increased collaboration, and make the nonprofit sector more accessible. It will help funders, nonprofits and government officials engage Colombians and their communities. Colombia, the fourth-largest country in the Western Hemisphere by population, has more nonprofit organizations per capita than any country in the Americas except the United States, the study found. There are 296,467 nonprofits, or about one nonprofit for every 163 Colombians, Evans estimates. The U.S. has one nonprofit for every 158 inhabitants.